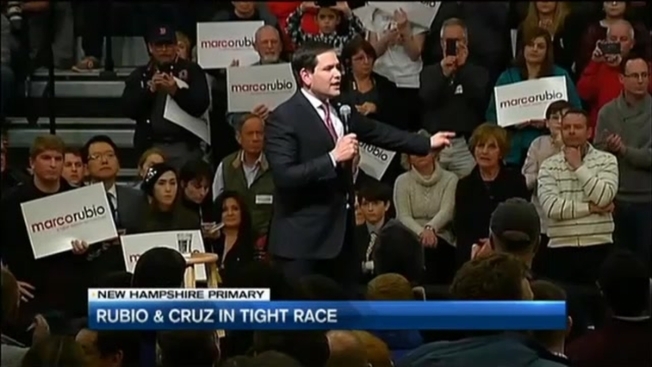 A quiet crowd of Marco Rubio supporters were disrupted before his rally even started. Protestors were escorted out of Nashua Community College in New Hampshire in time for Rubio to take the stage. Rubio told the crowd he was proud of the Republican field, but came out swinging against the Democrats. The Senator's energy was high, but his speech was shorter than some voters expected. Rubio is tied with Senator Ted Cruz for second place in New Hampshire behind Donald Trump according to the latest UMASS poll out today. Ted Cruz was also interrupted by protestors at a meet and greet in Raymond, New Hampshire. Two men claimed he was possessed by the devil before being escorted out of the event. Tensions and emotions were clearly running high on the eve of the first in the nation primary. Voters will make their final primary decisions on Tuesday in New Hampshire.